For a review of Shadow and Bone (The Grisha #1) go here. THE FEELS BROUGHT ON BY THIS BOOK. Feels hit you from all sides. I love love LOVE this series. I can’t believe it took me so long to get around to it! Alina is growing up. Or, more aptly, she’s growing dark. I CANNOT wait to see where she ends up in the third. Her character development was excellent. I felt her struggle and how it affected everyone around her, especially those closest to her. Having this acute knowledge of how Alina works makes these books that much more enjoyable. Watching her grow in her power was exciting and terrifying, and I really am very excited to see what happens next. I believe I stated somewhere in my first review that I was rooting for the Darkling? I rescind that statement. I’m all about team Nikolai now. The whole book I wanted to LOVE Mal. He was pretty sweet and took care of Alina, and I’m sure they’re the endgame, whatever. But I found myself thinking, if I’m being truly honest with myself, I kind of love Nikolai. He’s clever, handsome, vulnerable around Alina, noble, intelligent…the list goes on. Pretty much all Mal has going for him is they’ve been together forever and he’s an abnormally amazing tracker. I mean, I liked Mal in the second book more than I liked him in the first book. But when Nikolai first showed up, I found myself inordinately drawn to him. Oh yeah, this book has a love square. Just FYI. Bet you didn’t even know that was possible. But you know what? It didn’t bother me. Because the characters are so different, and Alina’s reactions to all three are so different, it actually kind of made sense. And all that tension was very interesting to read; it was interesting to see how the three relationships shaped Alina’s thought process and her choices. Because they affected her in three completely different ways. The Darkling is terrifying and I love that Bardugo has dropped the pretense that he’s wonderful. I still think there’s going to be some romance there, but I don’t think it will ever be how it was in Shadow and Bone. He has crossed into maniacal and evil, and while his relationship with Alina is seductive and on some level makes sense, he is still evil. He is still the antagonist. In the end, he’s bad for her. For everyone. Unless there’s some OTHER deep dark secret we still don’t know. I don’t want to give anything away, so I’ll just say that the conflict in Siege and Storm is extremely engaging. Bardugo gives the reader enough information to be very interested in what may or may not happen next without giving things away. The pacing is excellent; I never found myself bored or wondering when something would happen. I know some people complained that this book suffered from the “second-in-a-series” malady, but I would disagree. I thought it gave enough new information to be completely engaging and create even more interest for the third. 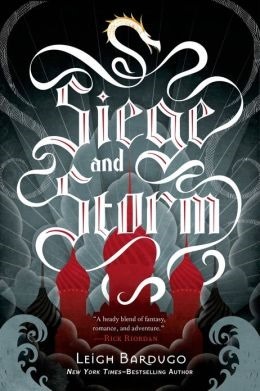 In Siege and Storm, Bardugo gave us a clearer picture of the world she created. She gave us a brilliantly written love square (I almost can’t believe I said that). She gave us a heroine that is worth reading and loving. I hope she gives us a satisfying conclusion.